Depart from Fairbanks in comfortable van conversions and travel along the remarkable Trans Alaska Pipeline. 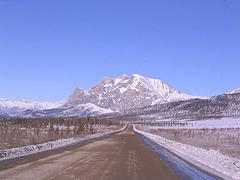 You'll follow the famous Dalton Highway, the solitary land route of Alaska's Arctic wilderness. Traverse the frozen Yukon River and enjoy the snow-sculpted forest. Cross the Arctic Circle in ceremonious fashion and receive an official Arctic Circle Adventure Certificate. Appreciate the low light on the horizon as it shines on the windswept arctic tundra. Arrive Coldfoot in early evening and get settled into your overnight accommodations. 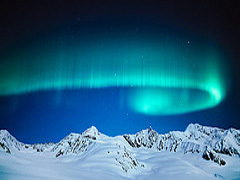 Aurora viewing expedition to nearby Wiseman. Accommodations: Located halfway between Fairbanks and Prudhoe Bay, Coldfoot Camp provides an excellent base for travelers in Alaska's Brooks Mountain Range. Although rustic by urban standards, Coldfoot Camp is clean and each room features two twin beds and private bath facilities in each of the rooms, a luxury in the remote wilderness of Alaska's Arctic. 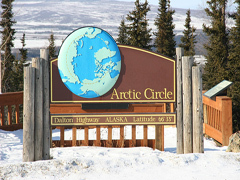 Explore today the arctic region on this safari: Enjoy an afternoon exploring the Brooks Mountain range on a drive north from Coldfoot on the Dalton Highway as far north as Atigun Pass. Departs Coldfoot at 10:00 am and returns at 6:00 pm. Meals not included. Box lunch can be purchased at the Coldfoot Camp. Arctic Village Aurora: Enjoy an evening tour to historic Wiseman for a unique cabin visit and an opportunity to enjoy the solitude of the Brooks Mountain Range as you scan the northern sky for Northern Lights. Cabin visit include Free hot beverages. Departs Coldfoot at 10:00 pm and returns at 2:00 am. Overnight in Coldfoot. Breakfast at the Truckers Cafe in Coldfoot. You have time to join another winter adventure (not included): Dog Sledding Adventures: Enjoy an experience with real Alaskan sled dogs. Learn what it takes to have a dog team in Alaska and enjoy. Fly back to Fairbanks with eagle views of the remarkable Trans Alaska Pipeline, symbolizing the immense changes brought to Alaska's Arctic by the discovery of oil over 30 years ago. Morning at leisure. Return to Fairbanks by noon. Fairbanks offers a variety of excellent gift shops and galleries such as the "Roseberry Art Gallery" with some tasteful items for your friends at home. Stroll through the city again before returning to the airport.